Had the pickup bed off last week and did the hutch and harpoon mods while I was in there. All seemed to go well. Primed the pump like 5 times afterwards, truck started up and idled fine for 10 minutes or so. That was last week. Finally put the bed back on tonight, reconnected wiring from frame to bed and to sender, truck started up fine and idled great (seemed quieter even). Got to a traffic light 5 minutes after starting it tonight and it began to give a slight hint of rough idle and the engine got a bit louder. Went down a big hill and then started up the other side and it felt like i wasn't going to make it (barely did). Pulled into a parking lot as it was dying and I shut it off. Primed the pump 4 more times, started up okay, idled a little rough and then smoothed out mostly but not completely. Gave it some throttle and the idle smooths out completely around 1000-1250RPM in park. Took it back down to regular engine idle and it seemed okay. So I pulled out of the parking lot and it barely made it another 500 yards and stalled. Primed pump 4 times, started it up, and limped it to a nearby parking lot where it stalled as I was pulling in. Primed the pump 4 times and moved it a little it so it wasn't blocking anything in the parking lot because i was due at work. It no longer smoothed out in idle. The synopsis is: obviously a fueling issue, unless i have more than one issue at hand. Only thing I messed with during the bed off was the rear wiring and the pump/sender unit, plus a rear pads/rotors job. I touched NOTHING under the hood. Seems like even though its a little rough it would idle all day in a parking lot, but it gets starved for fuel when in gear (ran idle up in park like I said and it ran smooth and didn't seem thirsty). I thought perhaps it was just air in the lines, but I read up on it and it seems like within 10 minutes the air should've worked itself out. Pump obviously works because after some priming i can get it to fire again. In an hour or so I'm going back to this parking lot to: fill up the tank (its about 1/2 right now), check fuel bowl level, check HPOP and pan oil levels. Anything else I'm missing? Can someone point me in the right direction? The catch is this: I'm in the middle of moving and have no idea what box the connector for FORSCAN is in, so that's really not an option for me. I need this truck to run like tomorrow or its gonna have to get towed and I'm gonna have to fork over a bunch of cash for someone else to fix something that I know can't be hard, but I just don't have the time. Did you put a Racor filter on the truck? If you did, crawl under it and see if you have fuel in the filter. I’m guessing you pinched something inadvertently when you put the bed back on... my suggestion would be to loosen up the bolts that hold the bed in place, maybe you’ll get lucky and that’ll give you enough space to look underneath it with a flashlight and see if the line got pinched . Did you replace The stock line with actual fuel injection hose or did you use something else? 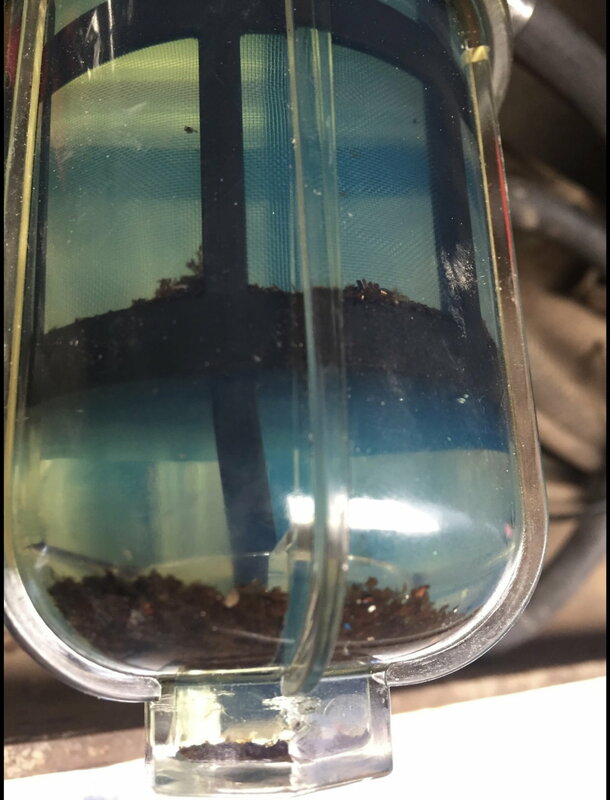 I did not do the extra filter with time constraints and after watching some dieseltechron videos; he said he didn't think it was that necessary as long as you change the fuel bowl filter often enough. Don't want to get into a debate about that stuff, but no extra filter and I did not mess with the stock fuel line connectors. Used the kit from Riffraff for the hutch parts. It definitely sounds like something is pinched, i agree, but it sure doesn't look like it. Fuel lines are all tucked in the C channel of the frame, maybe I cramped them in there too tight? If something was pinched though, why would I be able to run the idle up and have it run so smooth? I don’t care whether you use the filter or not, the only reason I ask it would give you a pre-pump window to see if fuel Is actually being pulled from the tank. It would also give you an idea of any air in the lines pre-pump. Just to verify, you reused all the stock fuel lines? If you used the stock line and connection at the tank I’m wondering if that is it loose? Did you hear a solid click? All stock lines yes, yes I heard the click but I’m not opposed to double checking that along with my other ideas. Did you remove the screens in the tank or just clean them out or replace them ? Removed screens in tank, but to be honest they were pretty darn clean, so I don't think I've got much debris in the tank. Granted the PO probably replaced them at some point, but I think I've owned it long enough that if there was much debris, my pickup screens would've been worse. Interesting idea though, I'll try the hose swap and pull from my brand new diesel can and see what happens if my other checks don't turn anything up. This filter screen on intake side of the pump, any idea if its on the pump or in the hose? I still can't get over the fact that it'll rev up nice in park or neutral... It's like the load of the trans is somehow starving it for fuel. Just to rule out something obvious, if you have a place nearby to scan for codes since you can’t locate your reader, I’d do that. It sat for a few hours before I got back there. Checked oil level and HPOP and both were fine. Fuel bowl was full but I did prime it twice before I looked. I hit the drain valve just before I primed and a little ran out but not what I would’ve expected, hopefully some air came out. Only had it open for 3 seconds or so because I was in a hurry. Added 10 gal which took it to 3/4 full tank. Started with no issue, idled fine. Drove it to my work parking lot like a mile down the street without issue and shut it off. I’ll mess with it later this evening now that it’s not going to get towed. Only other thing that would possibly make a difference aside from the fuller tank would be operating temp. In my mind this still has to be fuel related though. Anyone have any ideas what a possible warm engine fueling issue could be? Might look that route next after I check the lines and pump screen later today. Im kind of at a crappy point where if it just runs fine when I go back, was it just a ton of air in the lines/injectors that needed worked out, or am I sucking air at the pickup. Really don’t want to keep my tank at 3/4 from now until she retires, but I really don’t want to run the risk of stalling on busy city streets again either. Especially because boat towing season is upon us. Inside the pump housing, right at the inlet to where the pump unit is located, there is a 64 mesh screen. If that plugs, you're pump is done because there is absolutely NO way to disassemble the pump without tearing up the housing completely... I KNOW that because I've done it. That's also how I know exactly where the screen is. Below is a link to the thread where I posted a PDF of the complete pump tear down process which shows the screen near the middle of the document. Your timing probably doesn't allow you to wait for a Racor PS120 to arrive, so you can always use a short term solution of a smaller and even cheaper inline filter with barbed ends. I would order the Racor anyway and install it later once it arrives. Just my personal opinion and recommendation, and you can certainly choose your own approach since it's your truck..
Now, onto your problem... You do seem to have a fuel flow issue which could be because either a hose is pinched, your pump coincidentally has decided it's just too tired to keep going and needs to be replaced, or both. My proactive maintenance minded philosophy would tempt me to toss in a new Bosch replacement pump, and if that is not the problem, it eliminates it from becoming the problem later on down the road. The other thing you can do is re-lift the bed and make sure your hose is routed where it cannot get pinched. Either or both of those efforts should clear up your issue. Pete and John have your problem nailed, I would bet on it. My Racor filter looked like the one John posted too, just not as much debris. I clean 8t about once a year now because I see crap settled in the bottom. All of that crap would be plugging to pump inlet screen if it were not there. Your problem is most likely self induced. I hate when I try to improve something, but make it worse. It does happen sometimes though. Before I installed the PS120 on my wife's Excursion, I was using a little inline filter/strainer with a glass body. It was so small, though, that on two separate events it plugged completely with crud from the tank. Short term solution was to clean & drain the line and then blow backwards into the tank with compressed air, but you know what the trash in that tank will do... make its way back into the filter again. You can play the periodic game of cleaning and blowing the line back into the tank, but WHEN (not IF, but WHEN) your plastic pickup foot inside the tank crumbles and starts falling to pieces, it will not get to your strainer regardless of where it is... it will start plugging the hard line where it takes a 90° bend on top of the tank. If you replaced the foot with a new one during the H&H mod effort, you're years ahead of that crumbling process. Why did you reuse the factory fuel lines? A big part of doing those mods are to get away from the factory quick connects. They are notorious for sucking air into your fuel system. Air in a diesel fuel system wrecks havoc on it, I highly suggest doing away with those lines and spend the $20 it may be for a new fuel line and clamps. Actually I got the kit off a guy from here, can't remember who, and it even came with the lines and clamps. Didn't realize it was part of the mod itself, thought it was only necessary if running some extra filtration. Either way, got it working for now. I pulled the inlet line from the pump and basically nothing came out. According to all the videos I've watched along with previous fuel line jobs on other trucks, it should have been at least slowly streaming out. I had like 5 drops then NOTHING. Decided to test the pump itself, filled up a 16oz solo cup (all I had roadside) with clean diesel and hit the remote start. The pump drank that solo cup in about 10-15 seconds. Didn't see any large debris in the pump or line (not like I was expecting to be able to see anything), reconnected and off I went. Running fine now. Before I did the pump test I checked all the lines to make sure they weren't pinched under the bed and then made sure they were tightly connected. Not sure if moving the lines while checking them unkinked something or what. Hopefully it holds up until my move is complete and then I can replace the fuel lines with the rubber ones. I thought the hutch was more about getting rid of the in tank screens, but now that you folks mentioned it, I do remember reading about the factory lines sucking air. Pickup foot was in great condition, and the screens were clean, so with 215k on it I think the PO, who was very particular about maintenance, must've replaced them at some point. Thanks for all the help gents. It's good to know you have a good and fairly new pickup foot. I've fought the CFD (crumbling foot disease) twice, and it's a royal PITA until you get the tank open and the foot replaced. In fact, I have one sitting on the shelf to replace mine now when I drop the tank to replace the sending unit & float assembly. Mine has not yet crumbled, but I'm just going to do it while I'm in there.